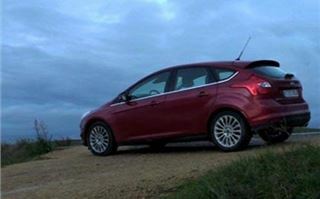 We loved the first Ford Focus, we liked the facelift 2nd generation Focus and we raved about the new Ford C-Max. 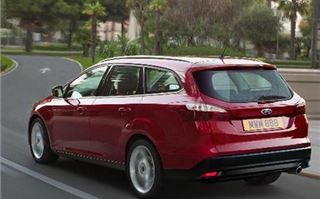 So why, while at last two Car of the Year judges were raving about the new Focus did ‘Autocar’ surprise itself by coming out a bit lukewarm after testing it against the Astra and the Golf. Partly steering ‘feel’ (though the Golf on test had completely different tyres). And I’d have to add maybe luggage space. For example, a boot shrunk from 385 litres to 277 litres if you opt for a full size spare wheel (316 litres if you go for a space saver or tyrefit kit), and down from 1,245 litres to 1,062 litres loaded to the ceiling. 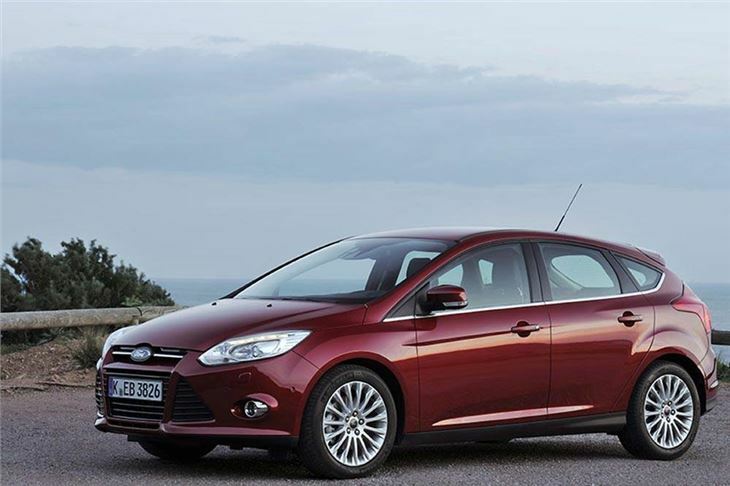 The rear boot alone is 93 litres smaller than an Astra’s and 73 litres less than a Golf’s. It’s only a 20 litres bigger than a Nissan Juke’s. Yet kerb weights are up a hefty 78kilos for the base version (8 kilos more than I weigh). So what have the stylists been playing at? Well they have made it more slippery, they have achieved much better average C02 figures and significantly improved average fuel economy. 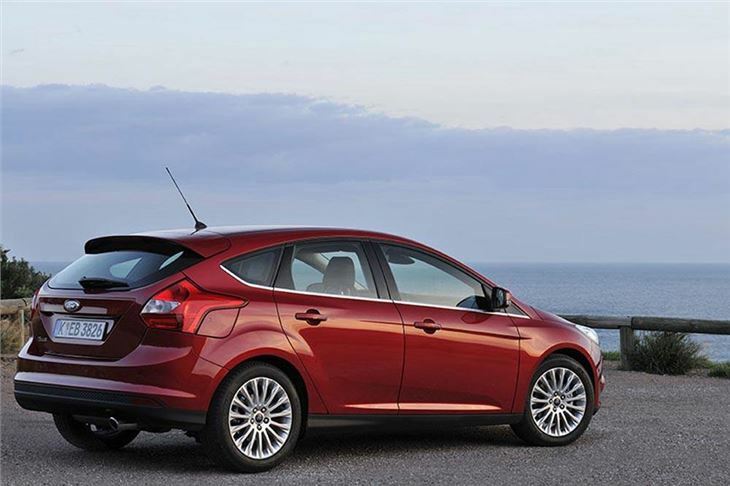 And if you want more space you can, of course, opt for the Focus estate, or the C-Max or Grand C-Max, of course. 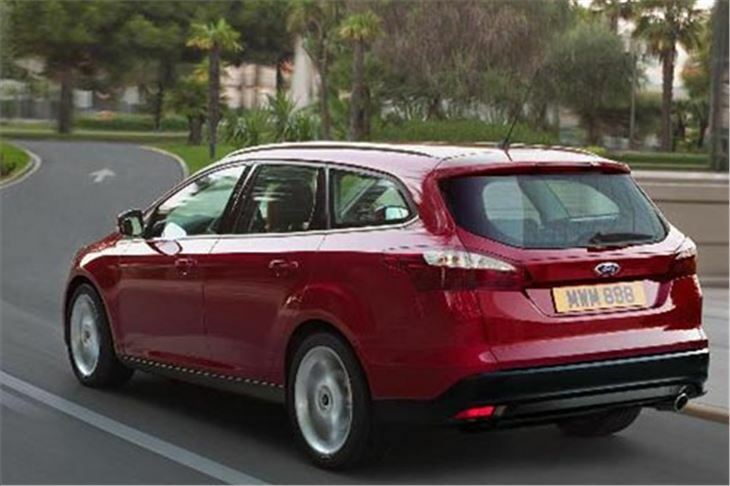 Every new Focus emits under 140g/km CO2, so is good news for company drivers and private buyers alike. 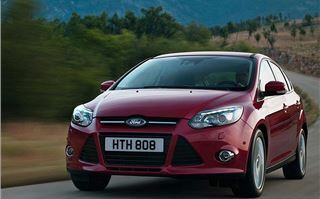 All the 1.6 petrol versions, including the 150PS Ecoboost turbo (a 140mph car) are just £110 a year to tax, as are the 2.0 diesel Powershift automatics. 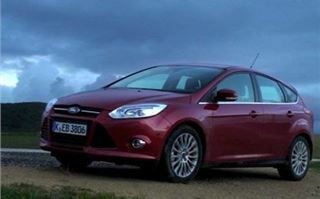 The 2.0 manual diesels pump out 129g/km so are £90 tax, and the new 8 valve 1.6 diesels qualify for just £20 annual tax. Theoretical EC certificated fuel economy figures are equally impressive. 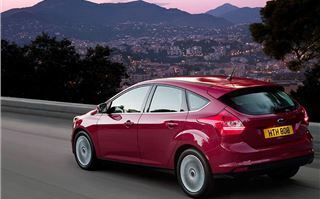 And for anyone wanting to avoid London Congestion Charges a 1.0 litre 3 cylinder Ecoboost turbo petrol engine is on the way that emits less than 100g/km. 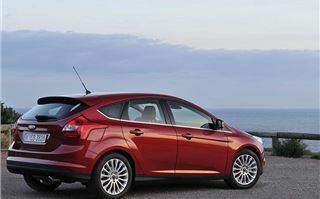 The Focus is a truly global car, looking the same and having the same powertrains wherever it will be sold, though not necessarily the same power outputs. On this launch we could only drive the 1.6 Ecoboost petrol with 180PS that will come to the UK later this year, and the 2.0 litre 163PS diesel with Powershift transmission that we will be getting right from the start. It rained in Spain quite a lot and the sensationally twisty test route really put the Focus new ‘torque vectoring’ system to the test. This is a trick differential that combined with ESP stops the car slipping without (annoyingly) cutting engine power. It works a treat. I think the reason why Autocar found for the Golf rather than the Focus in the dry is that all the launch cars were on low rolling resistance 215/50 WR17 Michelin Pilot Primacy HPs, while the Golf was on 225/45 WR17 tyres. On our test we were glad of the excellent wet weather performance of the Michelins. 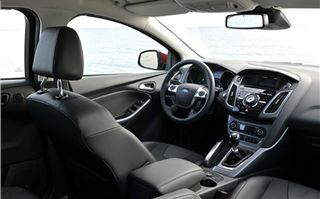 The new electric steering does take a bit of getting used to, more so in the 2.0 diesel than in the 1.6 Ecoboost, but once we did, we did we were fine with it. The softer suspension also helped the car to grip in corner so wet some of them were virtually flooded. With its heavier engine and transmission, the 2.0TDCI Powershift wasn’t quite so much fun, but wasn’t far off, though the means of holding gears by buttons on the shifter was nothing like as effective as paddles behind the steering wheel. 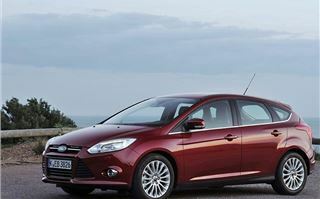 If you want an automatic, though, it’s the obvious choice, and a private buyer won’t pay any more annual tax for it than he would for the 1.6 petrol models. 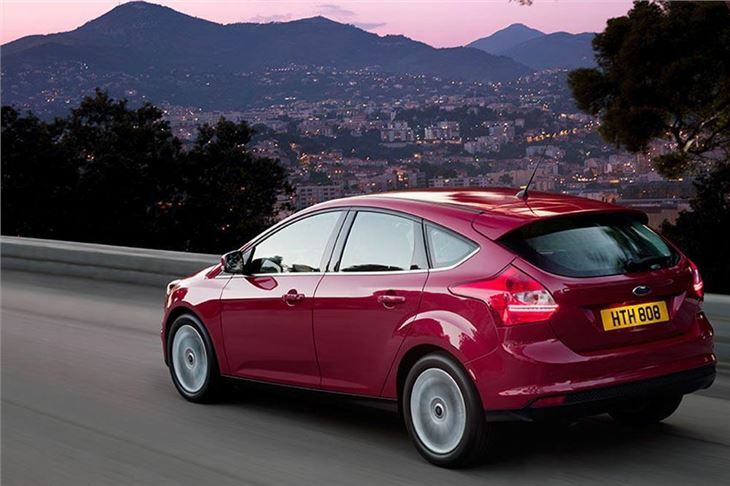 A new optional feature offered on the Focus range for £750 is the Driver Assistance Pack. This consists of a camera mounted behind the central rear view mirror that watches the road ahead and warns you of any circular road signs, including speed limits. At low speeds it also watched the road ahead and at under 15kmh will actually stop the car before it hits the car in front or a pedestrian. 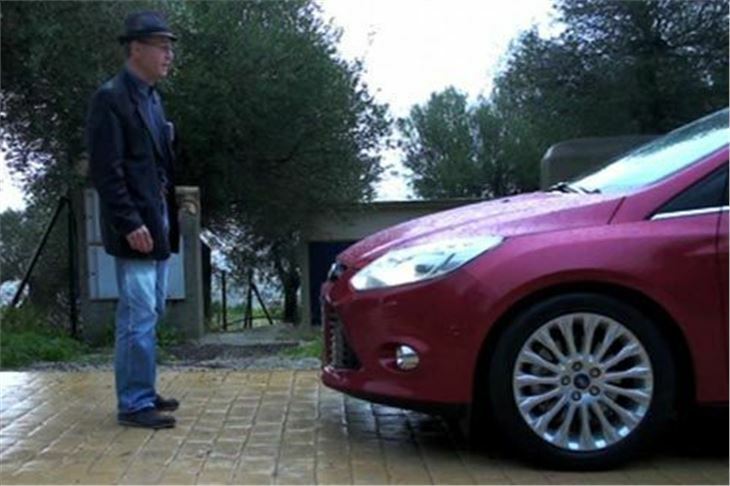 And yes, I believe in it sufficiently to put it to the test in the video with myself posing as the pedestrian. That’s not all, though. The system also watches out for any sign of driver fatigue and warns the driver, if the car starts to cross a white line the steering wheel shakes and if you stray out of your lane on a motorway without signalling the system will automatically guide the car back into the lane. Finally, the pack includes a Blind Spot Information System that flashes a yellow warning light in the mirrors if anything comes up behind you into your blind spot. So quite a lot of useful, gimmick free kit for your £750 and well worth the extra expense. 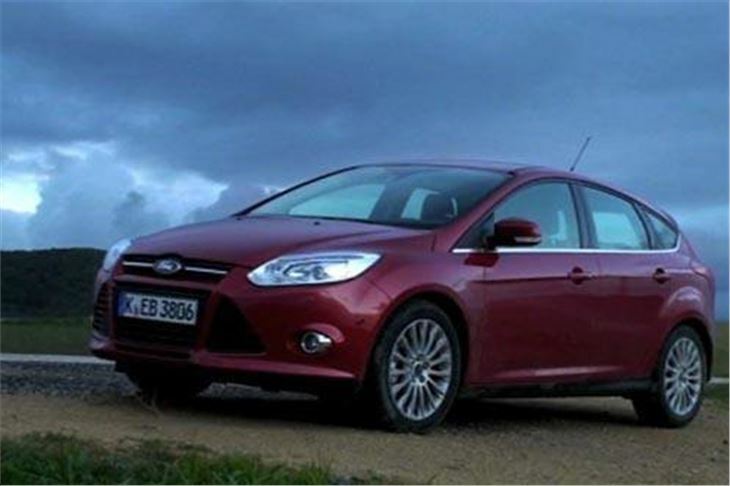 Prices are up a bit on the previous Focus, that, incidentally, continues in production in Valencia until the autumn. 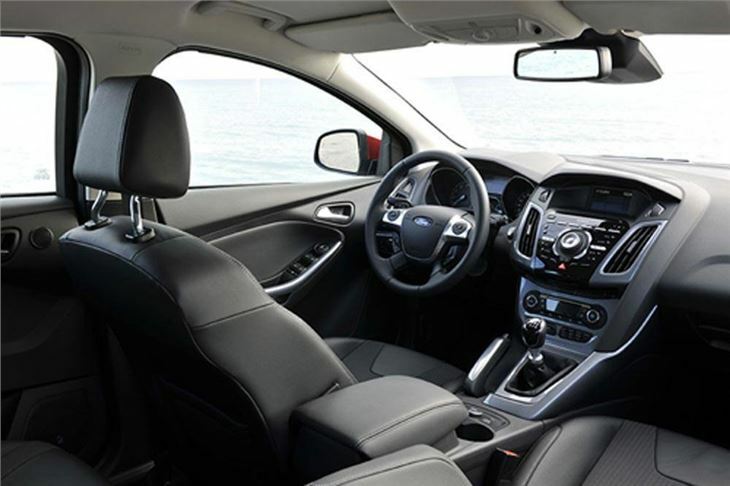 But every new Focus comes with around £1,000 worth of extra lit, including a Thatcham Category 1 alarm, DAB radio, voice activated Bluetooth for your phone, ISOFIX tethers for the outer two rear seats and adjustable lumbar support for the driver. 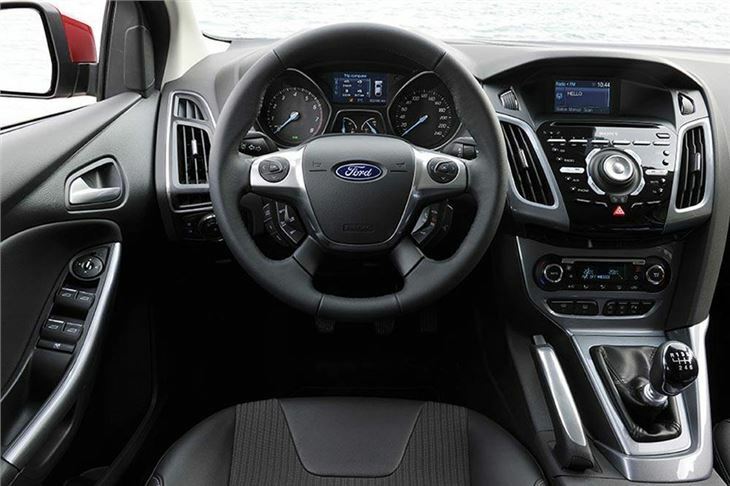 Finally, anyone who remembers Ford interiors of 10 – 15 years ago needs to raise their expectations. 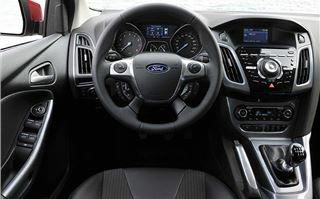 The dials, knobs, fit, finish and ambiance of the interior now rivals anything from Volkswagen and even from Audi. 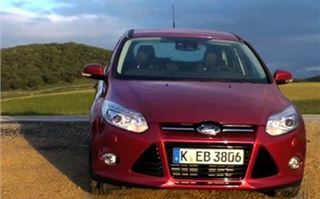 Whether a Golf can be “so much better to drive than the new Focus,” judge for yourself from our video. I’d be amazed to see a Golf doing that.